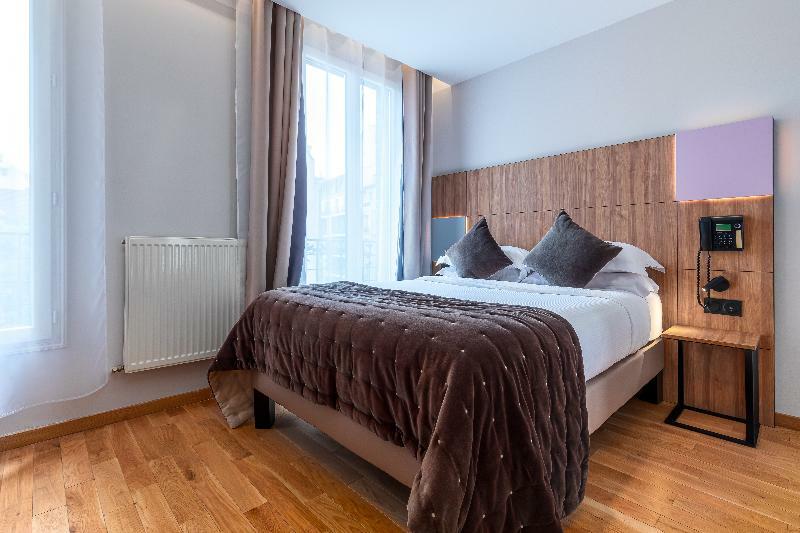 Located close to Montmartre and Sacré Coeur, the hotel enjoys privileged direct access by metro to the district of Champs Elysées, the Opera, theatres and Paris' Stade France. Ideal for couples or families, this 40-room city hotel is a unique address. Guests will be able to combine charm and serenity while they take time to discover the wonderful city that is Paris. The hotel offers a lobby area with 24-hour reception and check-out services, a hotel safe and lift access. Other facilities available to guests at this establishment include a bar and a pub, an auditorium and a restaurant. Guests arriving by car may use the hotel's parking spaces and garage parking facilities. In addition to a shower and hairdryer, in-room amenities include a TV set and Internet access. An iron and ironing board and a safe are also available. A continental buffet breakfast is served each morning.